If you haven't visited this week, I'm celebrating StampNation, a premier online community for passionate papercrafters where we share knowledge & gain inspiration through videos (over 80!) and written tutorials. I've been with Catherine at StampNation since the beginning and have loved watching the community grow and evolve!!! So, this week I'm taking a look back at what I've learned and I'm putting it to work! My above card uses the Burnishing technique. Basically, you stamp your image and then fill it in with color using your sponge dauber, moving in a circular motion. I love the beautiful outcome and how quickly you can make your own background! 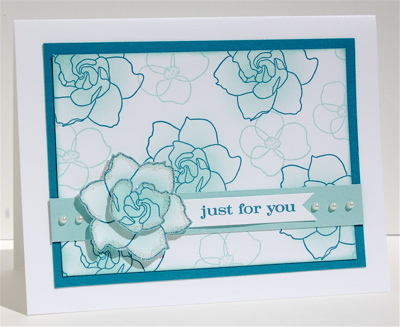 I stamped the focal flower twice, trimmed each one and layered them with dimensionals. I also added a bit of Dazzling Diamonds to make it pop a bit more! This layout was inspired by the SCS sketch challenge this week! Don't forget to head on over and check out StampNation! We hope you will join us! This week only, anyone who signs up for Catherine’s newsletter AND StampNation through this link will receive a package of handmade cards. You will also be entered to win the Because I Care stamp set by Stampin' Up! ***You MUST email me with your username when you sign up for StampNation to be entered to win the Because I Care Stamp Set!!! If you have signed up in the past through my links, please email me so you can be entered!!! !